I have no real knowledge of plants. I was wondering if someone could help me identify this plant. Hi Aarti, that looks to me like two superb examples of my all time favorite genera of plants - they are Aloe of some kind. These are sold everywhere as they're easy to propagate, and easy to grow if you give them bright light, infrequent watering, and benign neglect. Too much coddling can lead to root rot, excessively tall growth (which then flops over) or weakness, making it susceptible to mealy bugs or other insect pests. 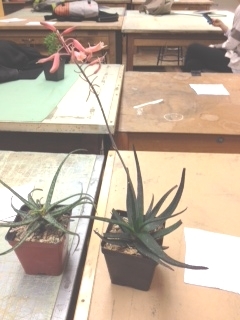 So, the two that you have appear to be Aloe andongensis, the smaller paler spotted one, which will have bronze to peach colored blooms in the fall, and the larger one with the pinky red flowers looks similar to Aloe affinis. 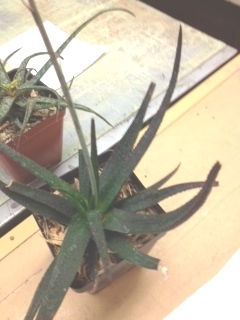 You can see more about my collection of Aloe succulent plants here.